My love affair with clay began in the early 1970’s as an undergraduate art student at a small Midwest liberal arts college. Counter culture influences and my farm-boy background combined, to make a career in pottery an appealing synthesis of practicality, art, and craft husbandry. Beth Kirchhoff, my wife of 41 years, is a musician; pianist, accompanist, and chorus master. We enjoy comparing the similarities of our chosen careers. The respect, understanding, and interpretation of traditional forms, both pottery and music, are clear priorities for each of us. 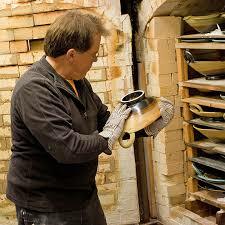 Loren Lukens of Brace Point Pottery wheel throws, casts, and hand build his unique line of functional ware for the table plus science inspired wall platters.